The Quick-Set™ 50 is the smallest of the Quick-Set family. But don’t be fooled by this feeder’s size; what it lacks in stature it makes up for with a mighty ability to attract and pattern game. The pail design streamlines setup and operation so you spend less time tinkering in the field and more time studying game activity. Just 5 minutes after you take it out of the box, the Quick-Set 50 is ready to get to work. Set the user-friendly timer to distribute feed up to 30 feet during dawn or dusk when game is most likely on the move. 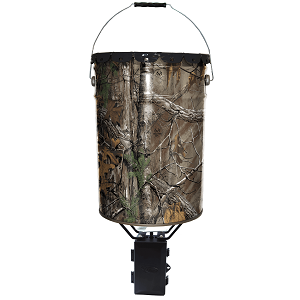 Many hunters appreciate pail feeders for their mobility, and the Quick-Set 50 is no different. From the first setup to the one-hundredth (and everything between), this feeder stays true to its quick-setting name. Want to try a different spot? Not a problem for the Quick-Set 50. Simply remove and find the new location that’ll bring the game to dinner.